The speaker of the Colorado House of Representatives will be the keynote speaker for a Black History Month celebration Tuesday, Feb. 16, at the University of Colorado at Colorado Springs. Terrance D. Carroll, D-Denver, the first African-American speaker of the house, will offer comments beginning at 6:30 p.m. at the UCCS Upper Lodge. His speech will support the 2010 Black History theme, "The History of Black Economic Empowerment," and also will be part of a celebration of the 100th anniversary of the National Urban League. The event will be in conjunction with a meeting of the Colorado Springs Black Chamber of Commerce. "We are honored to host Speaker Carroll as well as members of the African-American business community," said La Vonne Neal, dean of the College of Education. "A panel discussion with some of the most prominent members of the business community will add depth and feel to the national Black History Month theme of economic empowerment." Carroll, 40, has served in the Colorado General Assembly since 2003, was selected as assistant majority leader during the 2008 session, and speaker in 2009. He has written legislation on criminal justice and legal policy and is an advocate for social justice and education reform. He is a lawyer with the firm of Greenberg Traurig, LLP, Denver, and an ordained minister. Urban Spectrum Magazine recognized him as an "African-American Who Makes a Difference" and the Rocky Mountain News cited him as an "up and coming African-American leader." He is a graduate of Moorehouse College, Atlanta; the Iliff School of Theology, Denver; and the University of Denver College of Law. He also completed a summer leadership institute at Harvard University Divinity School's Center for the Study of Values in Public Life and John F. Kennedy School of Government. A panel discussion also is planned, featuring local businesswoman Queen Brown and Sam Hunter, a World War II veteran, Tuskegee airman and a founder of the Colorado Springs Urban League. 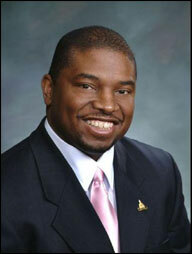 Kee Warner, associate vice chancellor for diversity, Academic Affairs, will moderate. The free event is open to the public, although space is limited. For more information on attending, contact Carla Rupprecht, crupprec@uccs.edu or 719-255-4134.